Magicka for mobile tablets might not sound like a logical next step for the franchise, but as soon as you try Paradox Interactive's Magicka: Wizards of the Square Tablet, you'll be all like "NICE". Recently released for iPad and Android tablets, the touch screen incarnation of Magicka features all the same spell creation, goblin frying, shield making, meteor summoning elements from the PC release reworked to feel a bit like Castle Crashers. It even preserves online co-op play, allowing up to four players to head out and "accidentally" burn each other to death in the heat of battle. If you've played the original Magicka you'll know what Wizards of the Square Tablet has to offer. 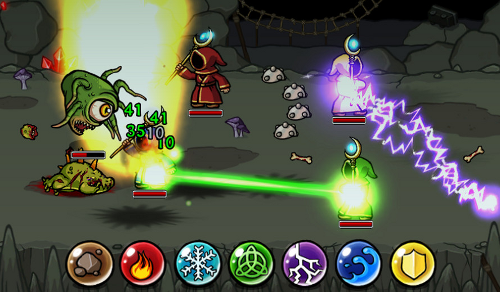 The familiar spell bases are lined up at the bottom of the screen, simply tap them to mix a bit of magic then tap the target to blast away. Expect the same level of humor as well, complete with the Swedish Chef voice acting and maybe a little hint of Vlad, who still isn't a vampire. New to the series is an armory with items, robes, scrolls and familiars to buy with gold earned through regular play or nabbed through in-app purchasing. Magicka: Wizards of the Square Tablet is currently available for iPad and Android tablets. It supports four player cross-platform co-op games.